So far, efforts to use open data to track officer misconduct and hold police departments accountable are few and limited. But with 18,000 law enforcement agencies across the country, each ruled by different sets of local regulations, there is no uniformity in how police misconduct is tracked, if at all, and in a majority of places, the public has no access to records of complaints filed against police. That might be about to change, as a civil rights group is preparing to launch a nationwide website that will allow users to file official reports of officer misconduct and abuse, while also making those reports immediately public. For years, Flex Your Rights, the group behind the Open Police Complaints initiative, ran “constitutional literacy” workshops, educating the public on their rights during police encounters. But they soon realized that wasn’t enough. “The events of the last few years have shined an important light on the fact that people are going to have bad police encounters regardless of whether they ‘flex’ their rights perfectly or not,” Steve Silverman, the group’s founder and director, told The Intercept. Instead, the new website, which is set to go live early next year, will aim to bring some uniformity and accountability to the police complaint process, by compiling research on different departments’ requirements and allowing users to either file complaints directly online — for those departments that choose to participate in the initiative — or upload the complaints they file on their own and share those reports publicly. The idea is to simplify the complaint process for citizens and minimize the need for people to file grievances in person at a police station, “where they’re bound to have another bad encounter,” Silverman said. The site will populate a report by asking users dozens of questions and will offer varying degrees of transparency, allowing users to publicly disclose anything from bare, anonymous details of the incident to full narrative accounts including names of officers and victims. It will also give police departments an opportunity to respond and update each report with the findings of their investigations. 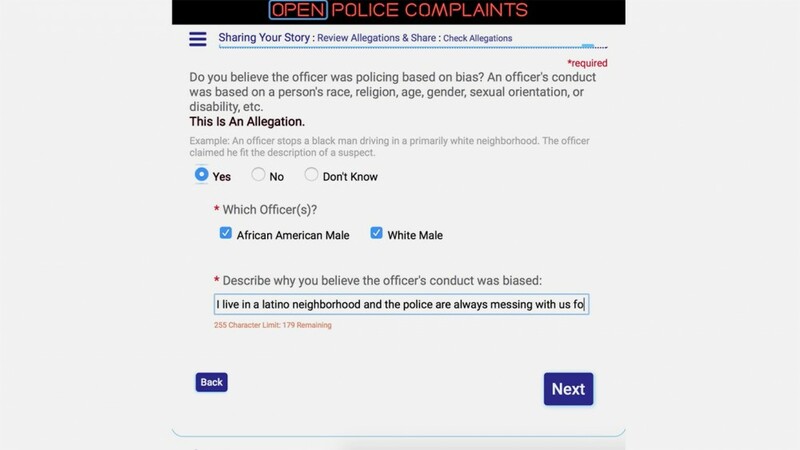 The Open Police Complaints web app, scheduled for a 2017 release. The group said it would protect the site from misuse and false reports — and potential libel suits — by requiring that all police complaints be officially filed before they can be shared publicly, and by flagging “frequent flier” users and filling the site with disclaimer notices reminding readers that the reports are allegations. It will also offer tools to connect citizens filing complaints with attorneys in their areas, as well as to other relevant resources. “We hope that by providing this kind of information in a public way, we’ll urge departments to take action,” Silverman said. But even if departments refuse to engage with the site — and Silverman and Morgan Lesko, the project’s main developer, expect it will take a few years to compile a significant volume of complaints and get departments to take notice — the reports will be accessible and easily searchable by anyone. This entry was posted in Police State, War On Drugs, War On Terror, WWO Multimedia and tagged Flex Your Rights, Open Police Complaints by Morgan Lesko. Bookmark the permalink.